Come out of the dark . . . and into the light! 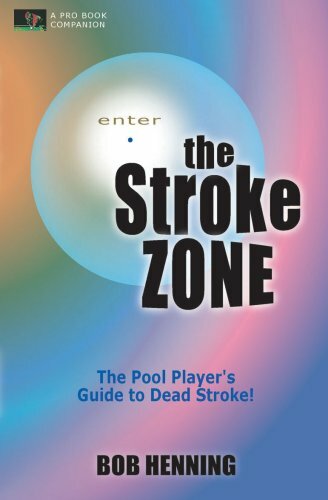 Enter THE STROKE ZONE, where dead stroke is alive and well! You've been there before. You know how it feels. The mind is quiet, the stroke is sweet, and victory comes time and again. You know what to do. There is no inner doubt, and nothing exists but the shot. It's what we pool players (and other sports participants) live for, and we want it all the time. That feeling -- that euphoria -- those great games that we play when we're in the zone! The problem is, as much as we long to be in that special place, most of us can't figure out how we ever got there, and more importantly, how to get there again. You may have always believed that the zone would only reveal itself when IT was ready --like IT had control -- only exposing itself in brief, fleeting moments. And you always hoped it would come along when it really counted. You've probably wished that you could bottle up this magical potion and drink it whenever you needed it. Well, good news! It's not magic. It's real! Drink in THE STROKE ZONE. You'll be amazed at how much control you have over this supposedly elusive state of mind. THE STROKE ZONE unveils simple strategies that you can use to influence not only how often you get in the zone, but how long you stay there. Once you are aware of the actions and keys you need, you'll have the ability to experience the zone over longer periods of time. Trust your intuitive self. Silence inner doubt. Relinquish control and let it flow! Get past the agony of hours (and years) of practice, only to find yourself too nervous and anxious to perform. Show what you're really made of! Experience the exhilaration of functioning at a higher than normal state of awareness, shooting effortlessly and confidently at every event! Dead stroke. Dead punch. In the zone. Pierce the myth. Enjoy the buzz. Read on and enter . . . THE STROKE ZONE! Bob Henning is an accomplished pool player, has played on the Pro Tour and cashed in professional events. He has dedicated 30 years of his life to the game and authored five pool books: Cornbread Red: Pool s Greatest Money Player, The Pro Book: Maximizing Competitive Performance for Pool Players, The Advanced Pro Book: Strategies and Training Techniques for the Serious Pool Player, The Stroke Zone: A Pool Player s Guide to Dead Stroke, and Pro Safeties: The TOP 100 Safety Shots in Pool. In addition, he has authored eight pool videos, currently packaged into two sets of four DVDs each: The Pro Book DVD Series and The Advanced Pro Book DVD Series. Committed to the advancement of the sport, Bob founded Bebob Publishing in 1995 to publish and distribute training materials and other interesting books and videos. He was a long-time contributor to the Amateur Billiard News, The National Billiard News, Inside English, and Inside Pool Magazine. His long running column, Pro Pool Work-Out was widely circulated. In addition to his interest in pool, Bob Henning has also dedicated much of his life to writing songs and playing guitar.